Thank you for this tip and photo. 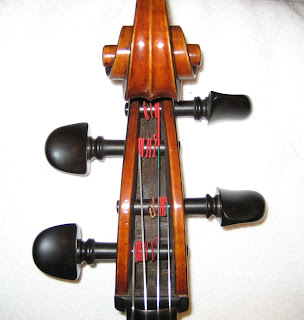 I am new to the cello and never took the time to study the peg box. It is interesting how nicely the strings align to the grooves in the nut when they are snug against the walls of the peg box. I was planning to set aside some time tomorrow to apply graphite to the adjustment screws of my fine tuner, another recently acquired tip. While I am at it, I will do some rewinding as well. Thanks again. I hear your pain with the slipping pegs. Glad you found a way to get some satisfaction out of it. I hate having to touch the pegs at all. Greetings, clenham. If you look closely, the strings are actually at slight angles with the nut when they come from the side of the pegbox, middle strings larger than outer. The tendency when you wind the string is to make a nice coil near the hole in the peg, which usually leaves the string coming down at a much straighter angle away from the side of the peg box. My suspicion is that the slight bend at the nut plus the friction at the side of the peg box takes up some of the string tension and makes the peg less likely to slip. The slight bend is another good reason to put graphite in the grooves at the nut for the strings to slide in, while you have your pencil out. BTW, I picked up this tip at orchestra rehearsal, when our Maestro (a violinist) recommended the remedy to one of the violinists with a similar problem. There's an epidemic of loose pegs here during winter. PFS, I don't like to tune with the pegs, either. I'm never sure whether the peg will fail to hold after I start to move it. 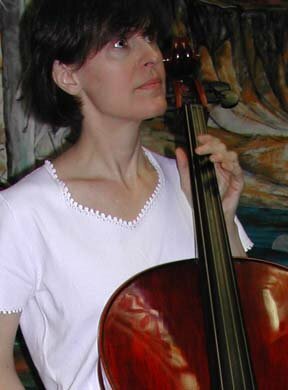 I have played 'cellos that tune easily that way, but alas, none of mine do.